During my life I’ve done a ton of work around advertising research and insight. One of my good friends works on the production of TV ads. This leads to a number of colorful conversations of us not agreeing. Starting with the basics … I love good commercials. I really do. A 30 second spot is truly the perfect little bite for my brain. When I worked with advertising agencies I would watch commercials, I’d read the trades, and I truly cared about those 30 seconds of messaging. Once I got a DVR the need to pay attention to those commercial breaks became less important. After getting out of the business I no longer needed to watch them at all. This is our first constant “conversation” (not fight — that would be petty of us). I DO NOT believe any data that says people with DVRs still watch commercials on a regular basis. I mean seriously … come on! My friend demands he does so people still do. Then I have to point out that he works in the business so of course he watches them but there is no shooting crew in Idaho. That audience has less invested personally into those breaks that a push of a button can make disappear or at least zoom by faster. This brings up one of my most passionate debates (not with this friend but just in general) … bad (or worse no) research. When an agency hires someone to do research on their commercial concept they want it to score well. They don’t want to go back to the client and say, “wow we thought we had these great ideas, you liked them, we liked them, but apparently no one else does so we need to come up with some new thoughts.” Because they want it to do well, because they are paying for this research, and because those they are paying want their client to be happy, the ad tests well. Bad research! How do they get away with this? The survey is built to lead a respondent to the answers they are looking for. The pool of respondents aren’t really representative of the national consumer. Finally, overall almost any data can be read in a way to pull out only the positives. Then everyone buys into it because after all “the numbers don’t lie.” Any brand owner who allows their agency to do their own research is making a mistake. This leads me to the advertiser. The final client. My friend and I have different opinions on why a commercial is boring or ineffective (Actually we are really just basing our argument on if it is entertaining or not. We aren’t running effectiveness testing for every ad we see.). He says it is a lack of creativity by the agency while I say it is because the agency has to make the final client happy and those folks aren’t creative and/or have strict company branding guidelines, etc. I suppose it could be both and our opinions are based on the work we have done and what we have seen. In my experience the company gets in its own way. Well, some folks with Sr., Executive, or a C in their title get in the way. I’ve consulted with a major insurance company whose company brand guidelines were so strict it made it nearly impossible for them to keep up with how innovative their competitors were being in the different advertising media. I’ve also had a financial institution, who purchased a huge TV spot placement, ask me to tell them how many new accounts got signed up just because someone saw the ad. Really … am I a witch? How exactly do you think I would be able to find out this information? The only way is to force everyone who signs up for an account, after the spot has aired, to take a survey asking why they became a client. Even that won’t work as most will write things like, “my wife has been hounding me to think about our future” not ” your ad on TV was thought-provoking, honest, and sincere.” Companies have ridiculous ideas on what their TV advertising will do. Your goal, especially in buying a high-profile TV real estate, is to increase awareness, loyalty and preference of your brand so when the customer is looking to buy what you sell he/she thinks of you first. None of this makes any difference if consumers aren’t watching your ads in the first place. TV ads are being fast forwarded through (despite what my friend and the ad trades seem to think), radio ads are notoriously boring, computer ads won’t keep someone’s attention since they can be avoided as easily as opening a new window, OOH (out of home / billboards) can only do so much, what is an advertiser to do? Glad you asked! If I was an advertiser I’d put my money on VOD and podcasts. Podcasts – Find the ones whose listening audience align with your target consumer and start sponsoring. This is a loyal audience who is dedicated to listening to the host of the show. Live reads (or as live as they get) by these hosts are gold. Some podcasts have a cult like following. Use that to your advantage. VOD (Video on Demand) – I really can’t explain to you how much I adore VOD. When I was in research I’d plead with anyone involved in the medium to please please please fix it. It’s hard to find, the menus are difficult to navigate and there is no easy way to see what is available. Still … I love it. I just think if someone took a little time to fix it up it would be beyond genius. If you build it they will come. Advertisements on VOD have changed a bit recently, which annoy me, but should make advertisers happy. The biggest change is that most major broadcast networks will not allow you to fast forward. That’s right advertisers …. YOU CAN’T FAST FORWARD. Here is the problem … the ads right now are horribly and tragically boring. Either the same ads that originally ran with the program are included or one/two ads play over and over and over and over. To make your ads work here you need to think about who is watching and when. Dated ads won’t work. If I’m watching a show delayed by a week after its’ original air date, I’ve already missed that Toyota Tent Sale. Do you know what is more annoying than being forced to watch boring ads? Being forced to watch boring ads that are so old they no longer even apply. Finally, don’t play the same ad over and over and over. You’ve now pissed me off. There is research to support that this just isn’t my reaction but I’m too lazy to go find it. You will just have to believe me. Here is where I have to give it to my friend. He said that advertisers should do a series of ads. BRILLIANT! Yes! VOD should have a sponsor per show and all ads should either be promos for that network or a series of ongoing advertiser ads that tell a cohesive story. Then it is almost like the program itself is breaking up the story of the featured advertiser, not the other way around. Sometimes my friend is smart but please don’t tell him I said that. It will make my next heated advertising conversation with him that much harder to win. Damn it took you long time to realize how right I am. riggins’ dead mouse toy is gross! He loved it! 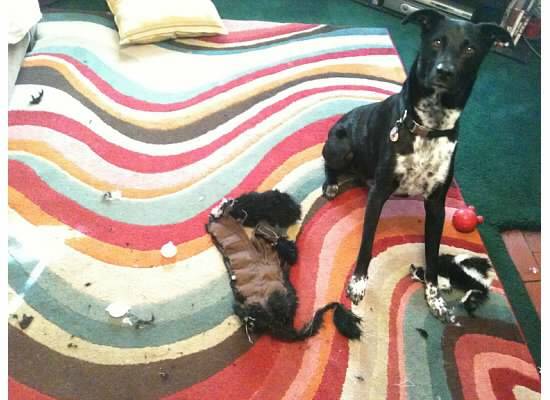 It was actually a skunk with multiple squeakers that he happily tore apart. It’s why he normally doesn’t get stuffed toys. He destroys them within minutes.